Enjoy the Mexicos capital, one of the worlds largest cities, in a culturally interactive environment that combines sophistication and modern conveniences with thousands of years of history, making it one of the country's most popular tourist cities. Tulip Inn Ritz Hotel is a revived architectural and historical jewel of XIX Century. The 120 totally remodelled rooms with all their amenities will provide you a magnificent satisfaction. Our flexible meeting facilities with a full service catering are at your disposal for all kinds of events. The Hotel Ritz counts with the restaurant La terraza where we offer you buffet breakfast everyday and a la carte menu. At the lobby bar El torero you can enjoy a drink of your choice and have a good time. 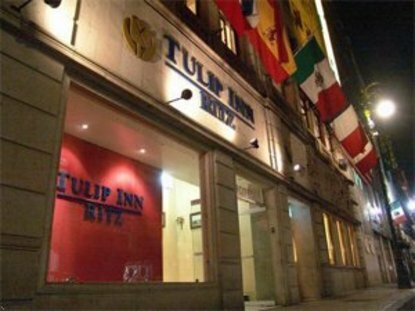 Both open from 7:00 to 22:00 hrs.If you are planning to visit Mexico City, you shouldn't miss coming to Tulip Inn Ritz. Its friendly and proficient staff will give you a very warm welcome.